Ever caught yourself watching one of those HGTV interior design shows where the contestants are literally placing on the finishing touches just as the judges are approaching their room? Try living it… that’s how we felt when we woke up on day 6, the day of our party, with floor still to lay, a space still to furnish, and a room still to decorate. I was convinced we would just have to have the party upstairs. Philip and Rebecca arrived at 9a and immediately we all hopped to it. 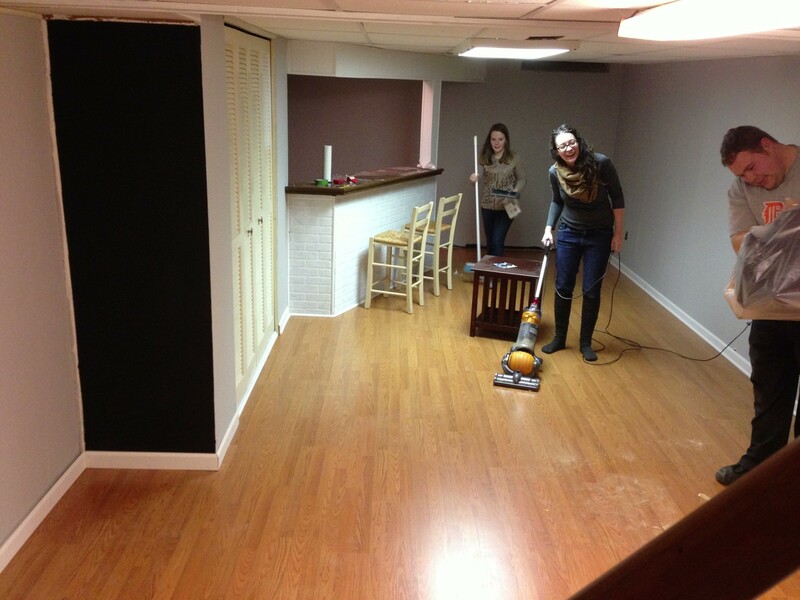 Phillip and I continued on with the flooring while Rebecca and Katie painted the bar. If you remember from day 3 the bar was looking like this. 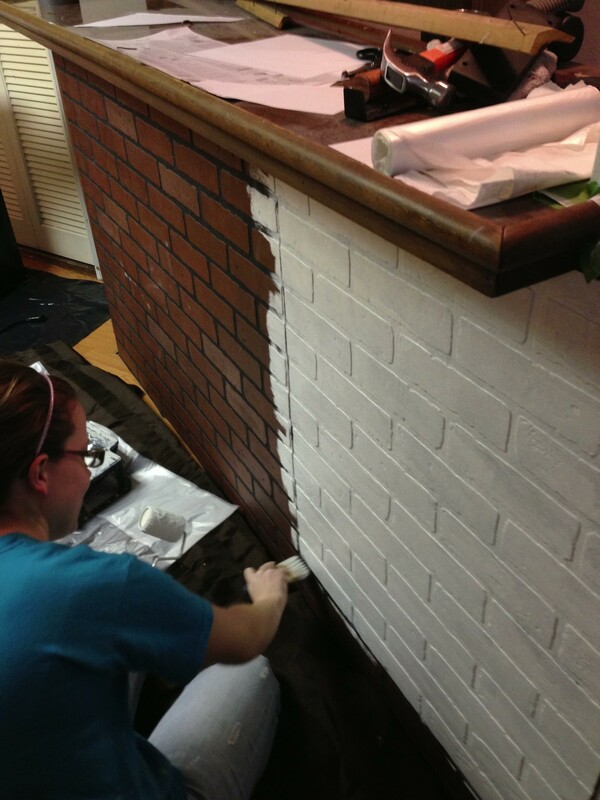 But our plan was to brighten (and lighten) the room up a bit by painting the faux brick white. 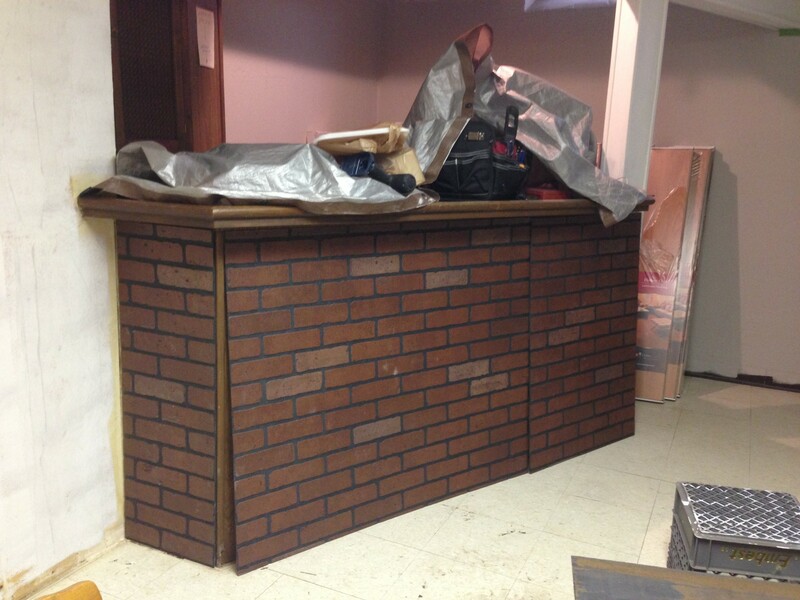 So with one coat of paint (no primer) the bar was beginning to take shape. We decided we liked the thin coat of paint with the brick just barely showing through. It added for a nice semi-rugged sort of look. Due to the way the room measured, Philip and I found ourselves needing to cut 1 inch strips of flooring to fill the gap between the wall and where the moulding would fall. I doubt you’re supposed to do this with laminate flooring but it worked, so why not? 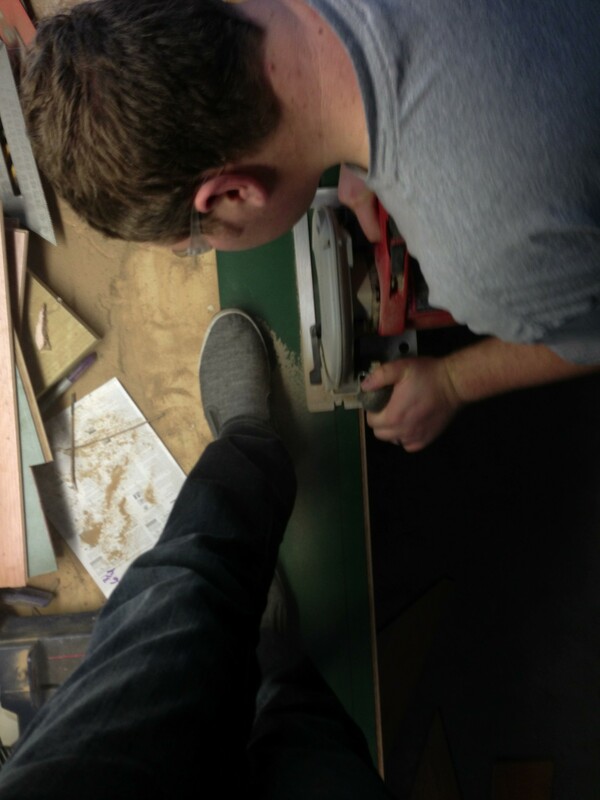 The only problem was how to cut the flooring length-wise without a table saw… Our solution? A slightly terrifying but incredibly trust building “don’t-try-this-at-home” moment. With the floor laid, the bar painted, and the walls dried from day 2, we were ready to begin laying the moulding. Mind you, it’ 5p and the party starts at 7p. So we got a bit of a process going. Philip would measure, I would butcher the cuts, Philip would correct me, I would recut, Philip would nail, done. It was awesome but I slowly but surely began catching on. 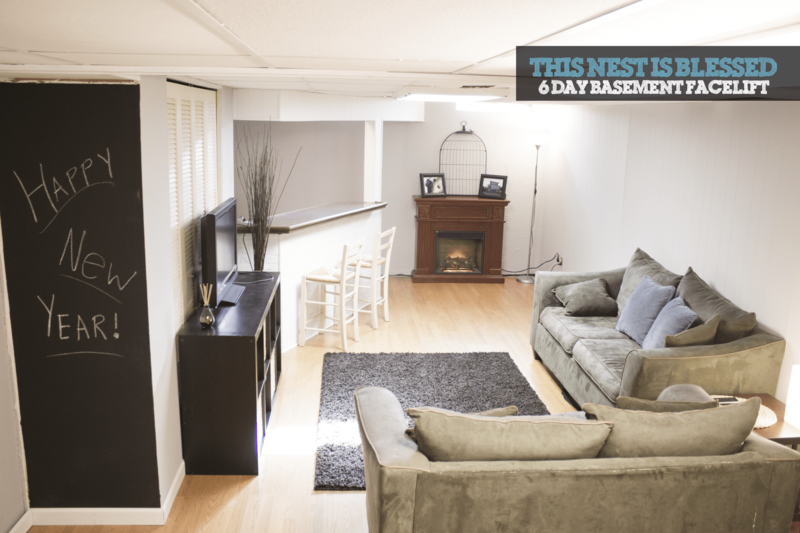 I should mention that 2 of the walls in the basement were still technically “unfinished” as they were poured concrete but we had painted them on day 2 the same color as the finished walls in a successful attempt to sort of blend it all together. It was a nice, easy and cheap way to make it feel cozy and finished without putting up studs, more drywall, and all that jazz. So we planned on using liquid nail to stick the moulding to the concrete. Not a problem at all, right? Oh yeah, except for the fact that I let our bottle of liquid nail dry up. Philip and I continued to work on the drywall walls while Katie and Rebecca made a quick trip up to our local Home Depot. Turns out HD closes at 5p on New Years Eve and it was 5:05 when they arrived. Needless to say, there wasn’t much we could do at this point. With the party starting in just under 2 hours we did everything we could and leaned the remaining moulding against the concrete wall for the party. Janky? Sure. Did it work temporarily? Absolutely. With 60 min left on the clock before guests started arriving all four of us began the cleanup process. I can’t really tell you all that went on because, to be honest, it was all a blur. There was sweeping, scooping, trash throwing, running up and down stairs and then suddenly it was clean. Now it was time for furniture. The cool thing about this room we were creating is that Katie and I planned on reusing all of our old/unused furniture that was sitting in various rooms of the house. Things like bookshelves from our old apartment, our couches that were replaced earlier that week, old lamps, an electric fireplace that had been in our bedroom, and chairs given to us by Katie’s mom. The only thing that Katie went out and bought was an area rug (and a couple of Ikea baskets). And now for a little before and after goodness. We really couldn’t have done it without the help of Philip and Rebecca. Thank you both so much! What an amazing transformation!! Looks great!! Thanks 🙂 We’re loving it. Just a few finishing touches to add!